GNORING the gusty wind, I balanced my camera on the roof of my rented Ford, pressed the self-timer button and ran like crazy. The resulting photo, a little off-center, shows some spidery hedgerows, pastureland and me, arms flung wide in victory as if I were showing off big game, my shadow rippling across a giant granite boulder. What you can't see is that the massive, mottled stone, the color and texture of elephant hide, is actually a capstone sitting atop squat stone legs. Before going to France last spring to research Romanesque churches in the region, I read an aside in a guidebook stating that there were more than 500 dolmens in Lot alone, dating from 2500 to 1500 B.C. A little more poking turned up a staggering claim: the limestone plateaus, or causses, of southern France and nearby river valleys are home to the greatest concentration of dolmens in Europe. Forget the standing stones at Carnac in Brittany, or the grandeur of Stonehenge; for sheer numbers, this was the place to be, With 800 dolmens documented in Quercy and 1,000 in Rouergue, the lure of prehistory was too great to ignore, and I decided to dedicate a portion of my trip to dolmen-hunting. I found 10. That may not sound terribly impressive, but I limited myself to one weekend and a fairly small area. Besides, tombs from the Neolithic, or New Stone Age, aren't on everyone's vacation agenda, which means that while you'll find plenty of brochures outlining foie gras and truffle tours — two other specialties of the region — dolmen maps are harder to come by (although the tombs themselves are well marked on both highways and footpaths). This means that dolmen-spotting in Quercy-Rouergue quickly assumes the aspect of a treasure hunt. You probably won't locate every dolmen you set out to find; but you probably won't care. The search leads you through landscapes so beautiful they defeat expectations of the word: textured uplands of scrub oak mottled with outcrops and rare wildflowers, and river valleys of gentle, easygoing greens and elegant stone villages, webbed together by tawny, twiggy windbreaks and gashes of oxblood earth. I began my quest in Espalion, where the road dust was the color of rare beef and my hotel, the Moderne, had an inspired restaurant called l'Eau Vive, which specializes in river fish (though I had pork, an option conveyed to me, after language failed, by a resounding snort from my waitress). Espalion is a thriving market town about 20 miles northeast of Rodez on the Lot River. It is separated from the Aveyron River to the south by a high, hump-backed ridge. On a mild Saturday morning, I corkscrewed in a rented car over the top of the ridge and down into the Aveyron Valley, intent on following a four-hour, rural car route outlined in a brochure produced by the tourist office in nearby Sévérac-le-Château, which promised to lead me to 17 dolmens. About 15 minutes west of Sévérac-le-Chateau, I found what looked like the outline of a reclining peanut on legs atop a directional arrow. It was a sign to the Dolmen of Buzeins, a half-mile down a path flecked with sheep droppings and wildflowers. My heart leapt when I spooked a quail out of a hedgerow; otherwise, there was only silence and solitude and pastures so green they seemed to vibrate. The rolling landscape looked like Wales, stretched out in a more generous geography. I found the dolmen before I knew it: a curiosity in the center of a field, strewn about with small stones like a gaggle of offspring. It was a knock-kneed little tomb, its two supports leaning together but the flat capstone still firmly in place, level as a tabletop. All three megaliths were fuzzy with golden lichen, and radiated the morning's sun. Less than 10 minutes later, I located the Dolmen de Galitorte alongside a secondary farm road. Like many of its mates, it sat on a sloping rise rather than atop a hill. The earth around it was the same shade of dark caramel as the cows grazing nearby. When I stuck my head inside — the dolmen was open at both ends, forming a perfect man-made cave — the sound of cowbells echoed off the granite in a convincing impression that I was hearing the distant past. Throughout the day, my route wound like ribbon candy along the Aveyron, which I repeatedly crossed and recrossed. More recent constructions competed for my attention: fieldstone barns roofed in gills of gray slate that from a distance looked like shiny, braided leather. In pristine villages — Biounac, Buzeins, St.-Amans-de-Varès — I found no people, no incidental colors or signs or plantings, only textured stone, white shutters and pavilion roofs whose edges curled up ever so slightly in a stylish wink. I had been cavalier about my dolmen-locating abilities. By day's end, I'd found 6 of the 11 tombs I sought; but anywhere else that number would be a bonanza. I found one embedded in a wall near St.-Amans-de-Varès; another freestanding tomb a few miles away, outside the village of Lugans, with its picture-book chateau; and three more clustered near one another off a windy farm track on the northern slope of the Aveyron valley near tiny Surguières. The next day, I left Espalion and pursued my dolmen quest some 25 miles northwest in Conques, site of the magnificent Romanesque abbey of Ste.-Foy. In her posthumous book of 2000, "Little Saint," Hannah Green recounts a hike from Conques to a nearby village, Lunel, on which she passed a dolmen called La Peira-Levada, which in Occitan means the Raised Stone. I found it easily, just off Route D46 between St.-Cyprien-sur-Dourdou and Lunel, on the left side of the road: a squat, sunken structure surrounded by a neat gravel drive, like a caged beast sleeping in a zoo. Bright yellow mustard fields offset its dark mauve capstone — 350 tons of granite — and flecks of quartz, mica and feldspar glinted in the sun. Ms. Green says that there was once a ring of standing stones, or menhirs, nearby, but that they were long ago confiscated by farmers for service in stone walls. She adds that the Celts (inheritors of these stones, not their builders) believed that megaliths marked places where the living could converse with the dead, though for her, as for me, their "ancient secret sleeps in the sunbaked, rain-washed granite." I took my self-timed photo in the wind, and moved on. From Conques, I headed about 35 miles northwest to the causses — the high, pale limestone plateaus of Quercy. I'd found a book, "Dolmens et Tumulus du Quercy," that provided wonderful information (in French), but annoyingly, maps like afterthoughts. Following one past Figeac, I overshot the town of Livernon, an accident that became a boon, as it led me eastbound on the D2, through the Causse de Gramat. Cultivated lands quickly fell away and I found myself in a wilder place than I'd ever known in France. Low hills of scrub oak fringed in lichen gave way in places to bare bones of limestone, poking through the red topsoil in bleached shades of cream, gray and coral. The air itself seemed to smell of stone. On the outskirts of Livernon, I found a sign on the D2 for the Dolmen de la Pierre-Martine, which pointed me 5 or 10 minutes down an achingly lovely farm lane. A short hike took me up a high swale, an excellent spot for a dolmen and for surveying the grasslands and treetops of the causse. The tomb had been reinforced, and a dog's leash lay draped across the capstone; underfoot, the earth broke out in granite outcrops so that I fancied I walked atop dolmens-to-be — or dolmens that never were. After spending the night in the pleasant town of Cajarc, 20 miles south on the Lot, I set out in search of a clutch of dolmens I had read about near Limogne-en-Quercy. A man at that town's tourist office confirmed their presence; he showed them to me on a map and said they were right alongside the cross-country pilgrimage route (the Chemin de St.-Jacques, also known as the G.R. 65/651). I never found them, but chance came to my aid, and I caught sight of a dolmen sign in my rear-view mirror in Martiel, just west of Villefranche-de-Rouergue, on the D911. Like the others I'd seen, this tomb was in deep countryside, placed there by another civilization that followed different roads. The surrounding Causse de Limogne was rough and beautiful, cross-hatched by gnarled branches and ringing with cowbells. I was shocked to find another visitor (the first I'd encountered) at the dolmen, a Frenchman named Bruno. We took photos as salamanders played over the capstone and wind shook the scrub oak. After a fine lunch at La Renaissance in Caylus, more dolmens lurked less than 10 minutes away, just outside Septfonds. A sign indicated several, but I only found one: a much-visited little tomb (a rare litter basket hung nearby) that looked almost like a natural rock formation. In the shadow of the capstone, however, I could see its support stones, and knew that it was man-made, albeit long ago by unknown hands. The French Green and Blue Series maps, depict dolmens and other monuments. The Blue Series is more detailed but covers less territory; the Green Series is more practical if you're traveling distances. These cost about $5 to $7, at 1.03 euros to the dollar, in tobacco shops and tourist offices, or directly from the shop of the Institut Géographique National, 107, rue de la Boétie, 75008 Paris; (33-1) 43.98.85.06; http://www.ign.fr/. The hiking guides by the Fédération Française du la Randonnée Pédestre also indicate the sites of dolmens. They cost $11 to $14 in bookshops in Rodez or Figeac and the federation's shop at 14 rue Riquet, 75019 Paris; (33-1) 44.89.93.90; www.montagnes.com/us/ffrp. The route I followed near Espalion is outlined in the brochure "Circuit des Dolmens de la Haute Vallée de l'Aveyron," available free from the Office de Tourisme de Sévérac-le-Château, 5, rue des Douves, 12150 Sévérac-le-Chateau, France; (33-5) 65.47.67.31, fax (33-5) 65.47.65.94; http://www.severac-le-chateau.com/ (in French). Another guide is "Dolmens et Tumulus du Quercy," by Jean-Pierre Lagasquie, about $22 at many tourist offices in Quercy. Dolmen de Lunel (La Peira-Levada): From Conques, head toward Lunel, turning left on Route D46. On the plateau, the dolmen will be on the left, before Lunel. Dolmen de la Pierre-Martine: From the west, follow the D2 toward Livernon; at the dolmen sign just before the village take a sharp right down a lane to another dolmen sign and take the footpath. From Figeac, take the D13 to the D2 through Livernon. The dolmen sign is on the left. 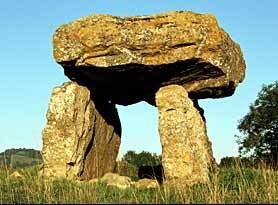 Dolmen of Martiel: From the west, head toward Villefranche-de-Rouergue on D911 and look for a sign for Martiel. Immediately after, look for a dolmen sign on the left. Follow the farm track several miles to a parking area and a footpath to the dolmen. The Musée Fenaille, 14, place Raynaldy, Rodez; (33-5) 65.73.84.30; http://www.musee-fenaille.com/ (in French), has a rare collection of figured standing stones from the region. Closed Monday; admission $2.85. Hôtel Moderne, 27, boulevard de Guizard, 12500 Espalion, (33-5) 65.44.05.11, fax (33-5) 65.48.06.94, http://www.hotelmoderne12.com/, is actually an old, half-timbered hostelry. The common rooms and staff are charming, and the 44 bedrooms are simple but pleasant. Doubles, $23 to $50; breakfast, $6. Its restaurant, l'Eau Vive, specializes in fresh local fish. An excellent three-course meal for one, with wine, costs about $20. In Conques, I chose the 14-room, two-star Auberge St.-Jacques, 12320 Conques, Aveyron, (33-5) 65.72.86.36, fax (33-5) 65.72.82.47,http://www.aubergestjacques.fr/, where doubles start at $48. Breakfast $6.50. A friendly lodging option in Cajarc is Chez Moulino, 46160 Cajarc, (33-5) 65.40.61.21, fax (33-5) 65.40.79.12. The four rooms are sparse, but a double with private bath and breakfast runs about $38. In Caylus, at La Renaissance, Avenue du Père Huc, (33-5) 63.67.07.26, fax (33-5) 63.24.03.57, I had a superb lunch of walnut salad and duck confit with a glass of wine for $14. PAMELA J. PETRO is writing a book on stone edifices in southern France.